Stanford claims farmers “dodged impacts of global warming” in the USA, but you have to find it first. Anthony rebuttal is to slap together charts of US corn yield and US temperature to “prove” that noisy regional weather data shows no global warming. He also alludes to the comical “CO2 is essential for life” argument. What global warming? The last two years of annual mean temperature for the USA (2009, 2010) is about the same as it was in 1980 and 1981, and lower than many years since. So Anthony’s entire argument is to compare two years of the US annual mean temperature, 1980 and 1981, against the two most recent years and declare that since they are “about the same” this proves that there’s no global warming? 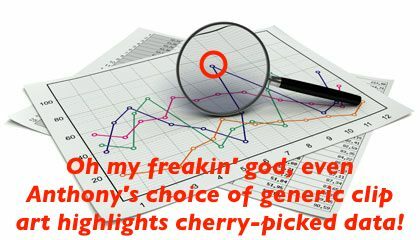 Dude, you’re a frickin’ cherry-pickin’ idiot. Anthony Watts took care to remove the trend from his version of this chart. 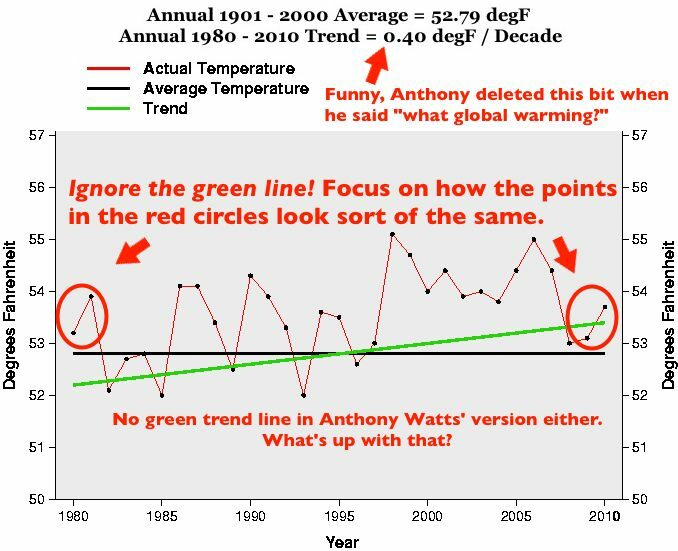 As usual Anthony’s also using several levels of cherry-picking to gin-up his “What global warming?” climate claim aside from the two-year comparison windows. The US Corn Belt is not the same geographic area as the continental US, so he’s not demonstrating anything at all about the Corn Belt climate. Likewise, the continental US represents only a fraction of the global record. The Stanford article also mentions an US trend towards anomalously cooler summers, which coupled with the unequivocal rise in annual average temperature implies warmer winters. US agriculture has been partly insulated from global warming by keeping the growing season temperatures within the crop’s tolerance zone. Why didn’t Anthony address that? Hmmm. “The GISS divergence problem: Ocean Heat Content“. Butter wouldn’t melt in citizen-scientist Bob Tisdale’s mouth, would it? He’s back with new proof that there’s no global warming and that them gubmint scientists is stupid. Anthony Watts approvingly notes the alleged “[denialist] reality versus [Goddard Institute for Space Studies] projection disparity” and declares “a GISS miss by a country mile.” Game over, yuck, yuck, yuck! 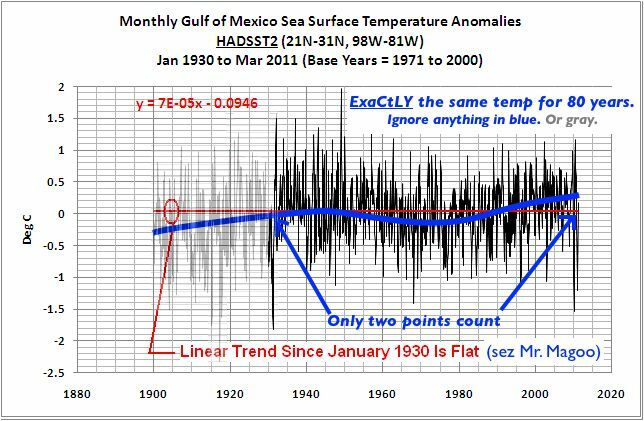 Tisdale’s claim is that Ocean Heat Content (OHC) hasn’t risen as fast as an old GISS model projected (note that this was not a prediction). Why? Well, because he can slap a projected straight line (Bob still loves ’em) on a chart that rises faster than the observations. Therefore, warmists are liars and their computers are too. This handily side-steps the real issue: Ocean Heat Content is unquestionably rising. We call this global warming. Except… Even Anthony has to give Bob a nudge in the comments for failing to admit that his citizen-science fair project is showing “anomalies” i.e. deviations from the trend and not the trend itself. Sure, the target man on the street won’t spot it, but it’s like plastering “kick me” all over your own back for the benefit of informed scientific observers like Tamino, to whom Bob’s posts are like candy to a baby. Tamino indulges his sweet tooth in Favorite Denier Tricks, or How to Hide the Incline. So how does Tisdale think he’s proven that the alarmist GISS projection of increasing OHC doesn’t match the measured increase? By using the classic denialist trick of showing the projection over a very particularly chosen time period from on a very particularly chosen point. This allows him to imply that OHC is flat but the GISS projection is increasingly divergent from “reality”. Anthony is silent on the this half of Bob’s deception because in the denialist playbook cherry-picking is enthusiastically endorsed. The following graphic collates Tamino’s deconstruction of Bob Tisdale’s game-playing. Perhaps Bob should submit his work to the National Science Fair’s Beeville branch? New cherry-picking and tunnel vision from Bob "Magoo" Tisdale. Deconstruction by Tamino. Are Gulf Of Mexico Sea Surface Temperature Anomalies Near To Record Levels? My blue trend is just eyeballing but it's a lot less contrived than Bob Tisdale's flat red line in this example from his "analysis". 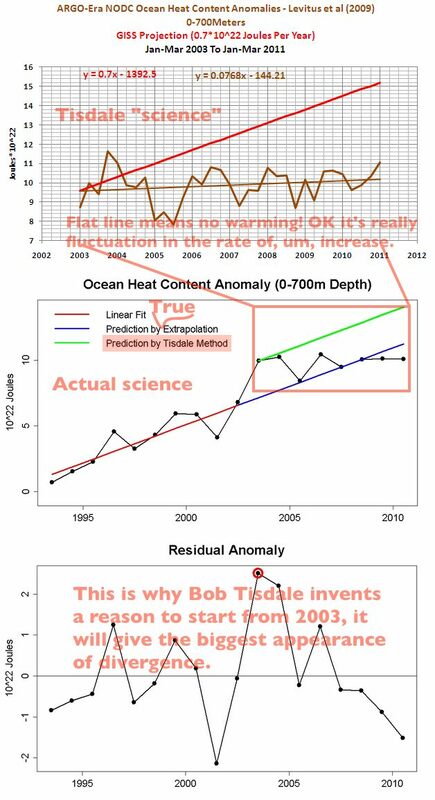 Unfortunately for Bob any open-eyed reader will see that every chart he tries to use as evidence reveals that he has deliberately picked dishonest comparison points that minimize the increase and he has ignored everything in-between. Details, details. Statistics, Bob. Look into ’em. There’s a reason scientists use ’em. “It’s probably nothing*“. Anthony Watts tries to slide another stupid “Snow! Somewhere!” post by as just a little “humor“. Apparently busy denialist copy-and-paster Tom Nelson noted that there was lots (41 inches) of ice in Nenana, Alaska (which is in the Arctic you know) on April 21st this year. But the ice was all gone by that date in 1940! Therefore global cooling. Nenana has held an annual draw to guess the date of spring breakup on the Tanana River for a century now, and this is Anthony’s new gold standard for global climate data. Like most northern rivers, the Tanana’s spring ice breakup is almost entirely dependent on flow volume during the spring run-off. The ice broke up, at a thickness of 39″, just four days after this astonishing climate evidence was presented. Also at 64°N Nenana is below the Arctic Circle. Willis Eschenbach accidentally undermines Anthony's "humor". Anthony’s teammate Willis Eschenbach creates the real punchline by inserting a chart (above) that shows that ice break up on the Tanana River is clearly trending to earlier dates. Or maybe he just can’t understand his own work. I guess Anthony’s readers aren’t subtle enough to follow Anthony’s attempt at humor; they’re reacting with stolid earnestness. 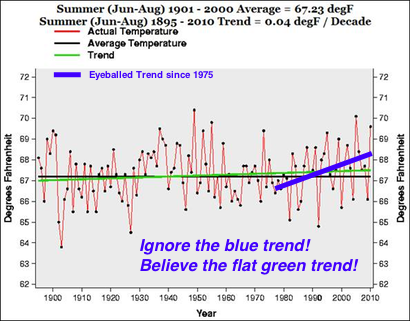 “In fact”, there has been no trend in temperature change there in a hundred years, and sometimes the “record” was, like, years ago! When denialists like Anthony Watts and Alan Cheetham want to present the illusion of a recent cooling period, they will reduce the number of years of temperature data until they can. When denialists like Anthony and Alan want to hide recent (post 1975) AGW warming, they increase the number of years they present. Denialists like Anthony and Alan will always cherry-pick a convenient location and claim that it disproves a global trend. Denialists like Anthony and Alan will always fixate on an outlier if it suits their argument, the wilder the better. Alan Cheetham's "flat" temperature trend — of just the northeast USA because nothing else exists — with post-1975 trend indicated. I guess we should listen to the Union of Unconcerned Scientists.